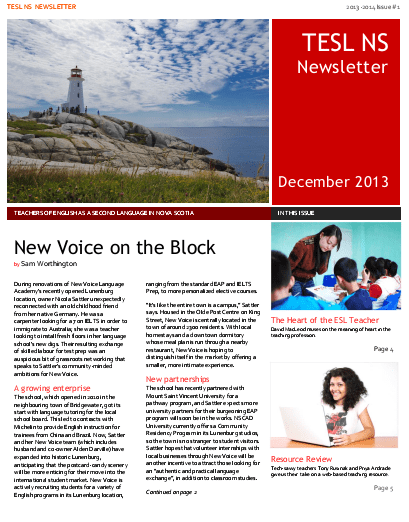 Click here to download the December 2013 issue of the TESL Nova Scotia newsletter. In this issue are articles by Priya Andrade and Tony Rusinak, Fe Leonor Baculi, Jennifer MacDonald, David MacLeod and Sam Worthington, and photos by Olga Sarycheva. Comments or contributions for future issues are welcome at editor@teslns.com.